Sunday 28th April at Footbridge Estate in Bombay, 59 Chamberlain Road, Bombay. With the impacts of climate change being increasingly felt here in New Zealand and around the world, not only do we need to reduce carbon emissions from our human activities, we need to also remove carbon dioxide from the atmosphere. Earth Day is on 22nd April each year. For each of the past two years, we have had small scale events – at St Andrews, Pukekohe. in 2017, and at St Paul’s, Buckland, last year. The Charcoal Fire nearing the time to extinguish it to create the biochar. Time to extinguish the 2017 fire so that the char we want is not all burned to ash. The young ladies had some fun with that and no one got wet. Jan Wallace, vicar of At Andrews extinguishing the 2018 Charcoal Fire under the supervision of the local fire brigade. For our 2019 Earth Day event we aim to sequester 1-2 tonnes of atmospheric CO2 in the biochar we will bury plus an additional 14 tonnes over 10 years with the fruit trees planted atop the biochar. That will make this event more than carbon neutral. 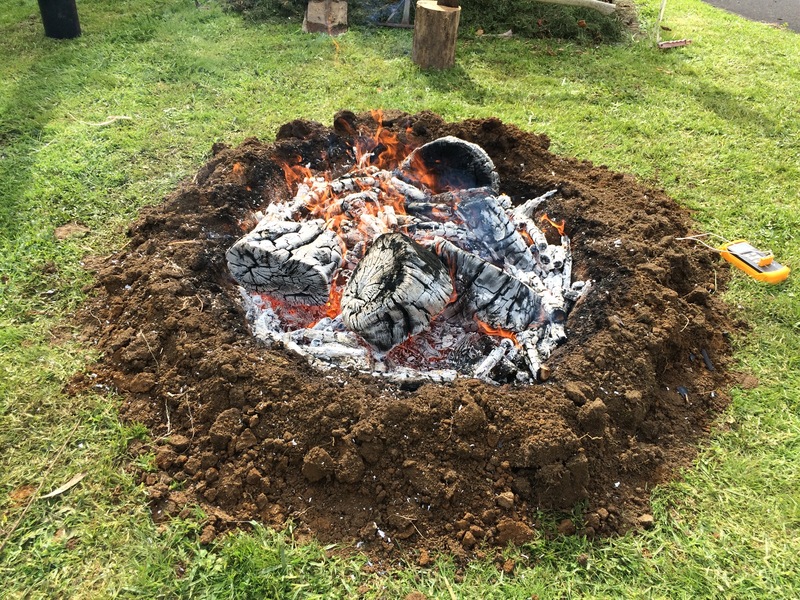 *** Carbon-negative: burying more carbon, in the form of biochar, than is burned in getting to/from and used in planning and running the event. Plus we will plant 50 fruit trees (==500 stems/Ha) over the biochar, sequestering CO2 at a rate of 14.1T/year for 10 years. To print the brochure: Click the image to open it in a new window and print it. Day 1: Saturday 27th April, 8 am to 12 noon. Food for sale at 1pm and 2:30pm. One dictionary defines sustainability as “the ability to be maintained at a certain rate or level”. Let’s consider water. On the one hand, we have had enough flooding throughout the country, to realise that we do not have a water flow (rate) problem. On the other hand, the dry period we have experienced this year has, for many, severely tested their access (level) to water. What this tells me is that we do not have a water flow problem but instead, have an issue with water storage. That problem is easily fixed with the local collection and storage of rain water. This concept, a rain water harvesting system, is what we have in the St Andrews, Pukekohe, community food garden. The consequence is that in this growing season just finishing, we have not used town water to keep the garden growing. In our food garden then, are climate and water sustainability actions that anyone can replicate at home. The food garden also features waste sustainability in the form of a worm farm and composting system that recycles food and garden wastes to apply to the garden as fertiliser. We have not imported any fertilisers to apply to the garden this year so from those perspectives, production from the garden can be sustained at its present rate. And of course, the garden itself adds to our community’s food sustainability and energy sustainability by growing our own food locally, and avoiding the carbon emissions from transporting it. Not only do these actions meet the sustainability definition above, they also provide for local resilience and a measure of adaptability to climate change. However, I prefer a more compelling definition of sustainability: meeting the needs of the present without compromising the ability of future generations to meet their needs. This is what last month’s global School Strike for Climate Action was all about. In what may well have been the largest global day of climate action ever, these young people are coming of age at a crucial time in our response to climate change. Unless we take action now, they will be the generation that will have their futures compromised, the generation that has to face the consequences of our past actions, but to which they have contributed so little cause. Here are two climate/sustainability actions that local people can take to help ensure their future is as fulfilling as our past has been. One is to join us on the Grow Your Own Food course that starts at St Andrews on April 10th. For six Wednesday evenings, from 7:15 pm to 8:30pm, we will cover food growing: from the role of soil organisms, through when to plant seeds and seedlings, and crop rotations, to planning your own easy-as productive and no-dig food garden. Second is to plan on coming to our 2019 Earth Day event. Spread over two days (Saturday April 27th and Sunday 28th) where we will take the next essential action in mitigating climate change: removing carbon from the atmosphere. 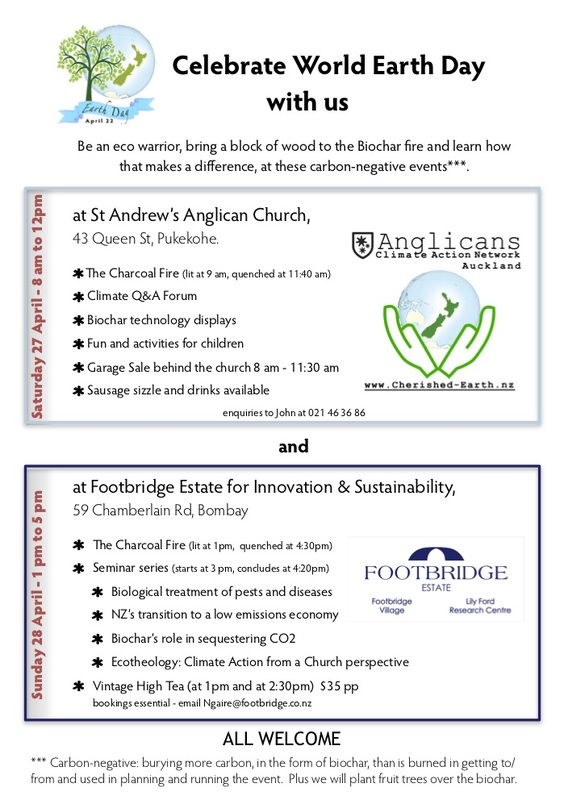 So mark your diaries now: The Charcoal Fire Earth Day 2019 event will be held at Footbridge Centre for Innovation and Sustainability, 59 Chamberlain Rd, Bombay, Auckland. October has been an impactful month from a sustainability perspective. The Government last week released a new report Essential Freshwater: Healthy Water, Fairly Allocated, on how to improve the quality of our freshwater systems. We will all be affected by new rules, to be in place by 2020, that are intended to halt the degradation of our freshwater systems. Those rules ought result in a noticeable improvement in freshwater quality within five years. Then, on World Food Day, leaders in the global food movement set out their clear opposition to “gene drives” in a new report, Forcing the Farm. The report explored controversial new genetic engineering technologies, the same tech that our government have proposed as a means to make the country pest free. The authors of the report present case studies on how gene drive organisms could entrench industrial agriculture and threaten food sovereignty. Their arguments are compelling. Then there was a new report from the Intergovernmental Panel on Climate Change (IPCC) that highlighted just how dire our inaction on mitigating the drivers of global warming will be. The report, which was commissioned by the United Nations, assesses the consequences of global average temperatures rising by 1.5°C. The climate actions required to avoid that level of warming do not make for edifying reading – we have as little as 12 years to slash global emissions by some 45 percent. The report is unequivocal – in case you hadn’t noticed, our climate is changing now. So political and social action and commitment is required now. There can be no more procrastinating. When it comes to the risks to humans from climate change, it is often the people least able to take action, who will be affected the most. This includes the poor and the elderly, our pacific neighbours who may be displaced from their homes due to sea level rise and our grandchildren. What climate actions can you take? There are two prime drivers of global warming. One is the emission of new carbon to the atmosphere when we burn fossil fuels. So cutting down on your fossil fuel use by driving less is a great climate action. The other is the removal of carbon sinks when we cut trees down. So planting trees is a great climate action too. Less impactful but still beneficial actions you can take are in the areas of household energy, food, waste and water systems. These four areas of sustainability are all founding principles of the St Andrews (Pukekohe) communal food garden. At a parish level, energy audits, starting a food garden (or food hub), composting of food and garden wastes and rain water harvesting are all easy-to-take climate and sustainability actions. And community building can be achieved by adding a Friend’s of the Food Garden group or a Grow Your Own Food course, alongside the food garden, will provide a base from which people can learn how to make small changes to their carbon footprint. These actions will also help us build resilience as we move steadily towards having to adapt to climate change. Homo Sapiens have lived on Earth for around 10,000 generations***, yet since the industrial revolution (1760-1830), just ten to twelve generations ago, we have been the cause of much lasting damage to the earth. We have degraded the world’s soils to the point that all it could be gone within three generations. We watched species loss occurring at an ever-accelerating rate – from 100 times the natural rate, to between 1,000 and 10,000 times in my lifetime. We have sat on our hands for two generations, and done nothing to mitigate the drivers of global warming that is now changing our climate. For over forty years we have known that avoiding disastrous climate change requires breaking fossil fuel’s hold on our economy and our way of life. And we have done so little. Cherishing our Earth has become something we give too little attention to. This came up at the Auckland Diocese annual synod earlier this month. Amongst the presentation was one by journalist Rod Oram, a member of the Anglican Climate Action Network. His topic was our christian roles in this time of climate change. One of Rod’s slides was a quote from American environmental lawyer and advocate Gus Speth. In this season of creation, we acknowledge the issues that humankind’s activities on this earth have caused. It is time we took action. On these and other related issues. How relevant is the quote and how right is the sentiment? What do you think? It’s an easy and sometimes advantageous strategy to overshoot a mark we have in our sights. When selling a house, it is usually the case that the asking price is set higher than the expected selling price. It gives some wriggle room for the negotiations between buyer and seller. And in salary negotiations, a confident job applicant has been known to overshoot the job’s salary target in the hope of influencing the employer to anchor salary negotiations at a higher level. That tactic can backfire on those who do not know the realistic salary expectations of the job. It’s a tactic used in golf. The chance of holing a putt increases by weighting the shot for the ball to go past the hole, rather than dropping in to the hole on it’s dying rotation. The downside of this overshoot strategy is that when one misses the target, the next putt may be even more difficult. So it seems to be when setting carbon emission targets. The Paris target of less than 2 °C of warming, will be difficult to achieve. So we see the tendency to allow global GHG concentrations to rise above the target level in the expectation of bringing them back down at a future time. Technology may or may not satisfy the expectation. If it does, then the costs of meeting the target will inevitably have risen over that time of procrastination. If it does not, then there will be no consequence to the procrastinators – that will fall on future generations. We can see this lose-lose overshoot strategy playing out now in the concept of Overshoot Day. Developed by the Global Footprint Network, Overshoot Day is a means to flag the date on which we ask more from nature, than our planet can renew in a year. Today (August 1st) is World Overshoot Day. This date reflects human demand for ecological resources across the planet, being 1.7 times what the Earth can sustainably meet. New Zealand had it’s own Overshoot Day. May 1st was the date on which Earth Overshoot Day would have fallen if all of humanity consumed like we do. Our demand for the earth’s resources is equivalent to more than three earths. What will life be like when the rest of humanity demands what we have and take for granted? When selling a house, negotiating a salary or playing a golf shot, overshooting the target may be a valid tactic. When overshooting the capacity of the Earth to supply resources, it is a tragedy in the making. Was there something special about Monday, 1st May 2018? Weather wise, the rain of Auckland’s weekend was clearing to sunny skies with a temperature high of 20°C and strongish southerly winds. Nothing special there. The news reports of the day covered a homicide, the closure of the Waitākere Ranges Regional Park to protect Kauri trees, and Auckland University promoting a public lecture, “Coasts in Crisis”, on the impacts of sea level rise. Two environmental headlines! Missing was a more significant environmental matter. May 1st was New Zealand Overshoot Day. The concept of Overshoot Day was developed by the Global Footprint Network as a means to mark the date on which we ask more from nature, than our planet can renew in a year. New Zealand Overshoot Day was the date on which Earth Overshoot Day would fall if all of humanity consumed like we do. May 1st corresponds to our domestic demand for the earth’s resources being equivalent to more than three Earths. Of the 36 countries with an even earlier Overshoot Day, Qatar heads the list at 9th February. Vietnam’s Overshoot Day concludes the list at December 21st – still requiring more than one Earth to meet their demand for resources. For 2018, World Overshoot Day will fall on 1st August. That date reflects human demand for resources across the planet being 1.7 times what the earth can sustainably meet. Obvious it is, that we have only the one Earth to meet that demand. The Earth is already showing signs of its unwillingness to meet our wants. Those signs include growing inequality, rising sea levels, a loss of biodiversity, extreme weather events, and much more. What will it be like when the rest of humanity demands what we in New Zealand have and take for granted? Global warming is behind many of the signals that nature is giving us. In a belated response to those signals, our government are taking action. When enacted, the much vaunted Zero Carbon Bill will set carbon emissions targets and pathways, and establish a Climate Change Commission to advise the government and monitor our progress on meeting those targets. Submissions on the Bill’s discussion document, which closed in July, were made by members of the Anglican’s Climate Action Network, Auckland. These can be viewed on cherished-earth.nz. Those submissions reflect the climate and sustainability actions that are already happening within the Auckland Diocese. But even those actions will not be enough to forestall the existential threat that the Union of Concerned Scientists warned of for the second time in 25 years. “Mankind is … facing the existential threat of runaway consumption of limited resources…” There will not be another warning in another 25 years. What is clear, is that our Earth will survive whether we cherish it or not. Not so clear is whether our grandchildren will enjoy a liveable climate – that depends on the Zero Carbon pathway we must now take. 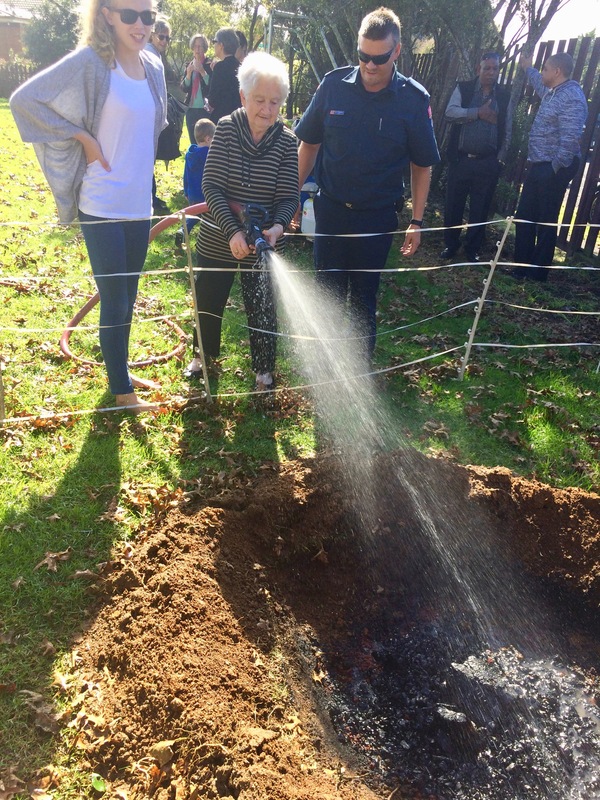 Earth Day 2018 being celebrated at St Davids Anglican Church, Buckland with a Charcoal Fire event. Here, Vicar Jan Wallace is helping quench the charcoal embers that were subsequently buried to sequester atmospheric carbon. This submission represents the collective views of the Anglican’s Climate Action Network (Anglicans CAN), Auckland, and does not purport to be the position of the Anglican Church of Aotearoa New Zealand. Anglicans CAN is a group of Anglicans who have been raising awareness, providing education and supporting political action on climate change issues since 2006 under the Cherished-Earth.nz initiative. Cherished Earth is a climate justice initiative of the Anglican Diocese of Auckland. e initiative is about taking actions that connect Christian faith with caring for creation, and is the practical outworking of a commitment made in 2006 by the Anglican Bishops of Aotearoa New Zealand, including Māori, Pacifika and Pākehā. Anglicans CAN supports the need to create certainty around New Zealand’s response to the challenges of our changing climate. We offer these considerations around the intentions of the proposed Zero Carbon Bill. The overarching principle to apply in developing the Zero Carbon Bill, must be one of social justice, not just for New Zealanders, but for all peoples of the world and for future generations. This implies equality in terms of the distribution of wealth, opportunities, privileges and obligations. For example, our climate actions must recognise the rights of people in developing countries to achieve the same standard of living and privileges that we take for granted. As the Earth cannot sustain our level of consumption of resources, it follows that our obligation is to reduce our consumption of the things we want but do not need. Another example is that if incentives and subsidies are to be made available, they must be able to be taken up by anyone, regardless of income, assets or standing in the community. The numbered paragraphs within this submission correspond to the questions posed in the Zero Carbon Bill Discussion Document. 1. The Government must set an ambitious 2050 target in legislation now. A goal around “net zero emissions” is not adequate because it assumes an unspecified level of gross carbon emissions with offsetting to achieve a net position. Offsetting unconstrained gross emissions is not sustainable because the supply of land suitable for tree planting is limited, and the Government cannot guarantee that it will be able to purchase international carbon credits indefinitely. That 2050 reduction target must focus predominantly on the release of new carbon to the atmosphere, and less on the recycling of existing carbon gases. New carbon is defined as carbon that is locked into the earth as coal, oil and natural gas, and is therefore, not already within the existing carbon cycle. Carbon Dioxide generated by the burning and mining of previously sequestered fossil fuels is an example of new carbon. Methane emissions from the exploration and mining of fossil fuels is another example. The emissions from these sources must go to zero. Biological sources of methane generated by the agricultural sector, is an example of a gas already within the existing carbon cycle. The emissions from this source have already stabilised (since 2011) and have grown by only 5.6% since 1990 (calculated from the 2016 Greenhouse Gas Inventory published by the Ministry for the Environment). net zero carbon dioxide excludes nitrous oxide and so this option cannot be supported. net zero long-lived gases and stabilised short-lived gases does not explicitly provide for zero new carbon gases and so this option cannot be supported. 3. net zero all gases (CO2, CH4, N2O) ignores the fundamental differences between short and long- lived gases and so this option cannot be supported. 3. How should New Zealand meet it’s targets? Use of the term “net emissions” in each of the three options within the discussion document, make the explicit assumption that tree planting will offset gross emissions and that any shortfall on the target, will be offset with international carbon credits. Anglicans CAN do not see this as an acceptable response to the very serious challenges that global warming represents. Our submission distinguishes between the emissions of new carbon from the mining and burning of fossil fuels, and the recycling of existing atmospheric and oceanic carbon already within the carbon cycle. Emissions of new carbon must go to zero in gross terms; they must not be off-settable through tree planting nor the purchase of international credits. Having a target for zero new carbon means that tree planting can be focused on the removal (sequestering) of CO2 from the atmosphere. We recommended a separate target be set for the tonnage of CO2 removal by tree plantings. 4. Revisions to the 2050 targets. We agree that the 2050 target could be revised but with the proviso that any revised target be no lesser a reduction target than exists already. That is, once the initial target is set, any revised target may be increased but not reduced. We believe that it is very important that the Zero Carbon Act be protected from dilution by political interference. It is acknowledged that the Act could need to be repealed. We envisage this only in exceptional circumstances, and then only following a public referendum that approves such a repeal. 5. Yes, we agree with the proposal for three successive budgets, each of ve years’ duration. 6. Yes, the Government should be able to alter the last emissions budget (years 10 – 15) but only during the term of the first budget period. 7. No, the Government should not have the ability to review and adjust the second emissions budget. Any government having this ability, would work to negate the certainty the Act would provide, especially in the build up to government elections. 8. Anglicans CAN believe the Climate Change Commission ought have a role greater than just advising the government on policy decisions. In particular, we believe the Commission must have a regulatory role as noted in point 11 below. We have no view on the considerations the proposed Climate Change Commission may take in to account. 9. Yes, the Zero Carbon Bill must require Governments to set out plans within a certain timeframe to achieve the emissions budgets. 10. The single most important issue for the Government to consider in setting plans to meet budgets is that our economic system does not support economics based on planetary/national resource boundaries. For example, the work of the Global Footprint Network suggests that our present use of global resources, requires 1.7 earths to meet our demand. If every person lived like New Zealanders, we would require 3 Earths to meet the demand for resources. Such levels of resource use are clearly not sustainable, pointing up the need for an economic system that works within planetary boundaries. 11. The Climate Change Commission ought have a regulatory role (perhaps along the lines of the Reserve Bank and Commerce Commission) to ensure that actions are taken, and not just talked about. Such a role should be protected against political appointments and interference. 12. The NZETS needs to be replaced with a Carbon Tax. The current pragmatism around there not being enough differentiation between an ETS and a Carbon Tax to justify the costs of changing over, ignores the ineffectiveness and abuses of the ETS that have occurred to date. Systems thinking expertise should be specifically included. Without this level of expertise, there is a danger that a reductionist approach to the issues will be adopted, leading to incomplete analyses and ineffective actions that work to sustain business as usual. Likewise, a problem solving ability should be listed within the expertise requirements. 14. The Carbon Zero Bill ought not cover climate change adaptation. To do so, runs the risk of taking the focus away from the urgent need to mitigate the drivers of global warming. Adaptation strategies do need to be developed, but within their own enabling legislation. We believe that adaptation measures (including the new functions proposed) are necessary, but not desirable within climate mitigation legislation. 16. An adaptation reporting power should be established, but done so within a separate Climate Adaptation Bill and outside of the powers of the Zero Carbon Bill. I was at Fieldays last week, as an exhibitor in the Innovation Centre. It was an exciting three days plus one. Here are some thing that struck me as I observed the weather, the people, the products and of course, the innovations. First was that despite being the 50th anniversary year, the weather still made its presence felt. ’Twas not the parka-penetrating chill of the sou-westerlies. Nor the eeriness of foggy mornings. No, it was the wheel-spinning wetness that led to hour-long waits to get out of the parking lot that I remember most about the weather. Is 50 years not long enough to solve that energy-consuming problem? Then there were the people. Those who looked away when eye-contact was imminent, those who freely gave a big smile without expectations of anything in return, those who listened to learn about dairy’s role in climate change, and those who either did not care or simply did not want to know. Guess which group was in the majority? That so much of the activity was focused on products that we want but do not need, was the big disappointment for me. We will never achieve societal and environmental sustainability for as long as we try to consume our way to ego-satisfaction. Finally, innovation in the agricultural sector is a major aspect of Fieldays and there were some really great ideas on display. However, unlike the judges view that the winners of the awards choose their problems to solve with care, it seemed to me that they choose their products not to solve the problems that the world need solving, but instead, chose them to make a profit. Will I return for Fieldays 2019? Of course I will. Despite my cynicism, it was still a buzz. But I could do without the Saturday when the general public turn out. The future of the Earth as we know it, is under threat. Scientists have named that threat global warming. We already see some of the impacts of global warming: climate change; extreme weather events; the loss of animal and plant species; rising sea levels; and the acidification of our oceans. The main drivers of global warming are twofold. First, the mining and burning of fossil fuels adds greenhouse gases to the atmosphere. Second, when we cut down forests, we reduce the Earth’s ability to tolerate those gases. To reduce the impacts of climate change, two things we must do. One is to significantly reduce our individual and household greenhouse gas emissions. The other is to remove carbon from the atmosphere. The longer we take to do these two things, the harder is the task of ensuring a liveable climate for future generations. EARTH DAY 2018, is the day to show that we cherish our Earth, the day to take a personal climate action to help ensure the Earth’s regeneration and protection for future generations. Next Sunday, April 22nd, the Anglican’s Climate Action Network are offering an easy-do climate action that anyone can take. 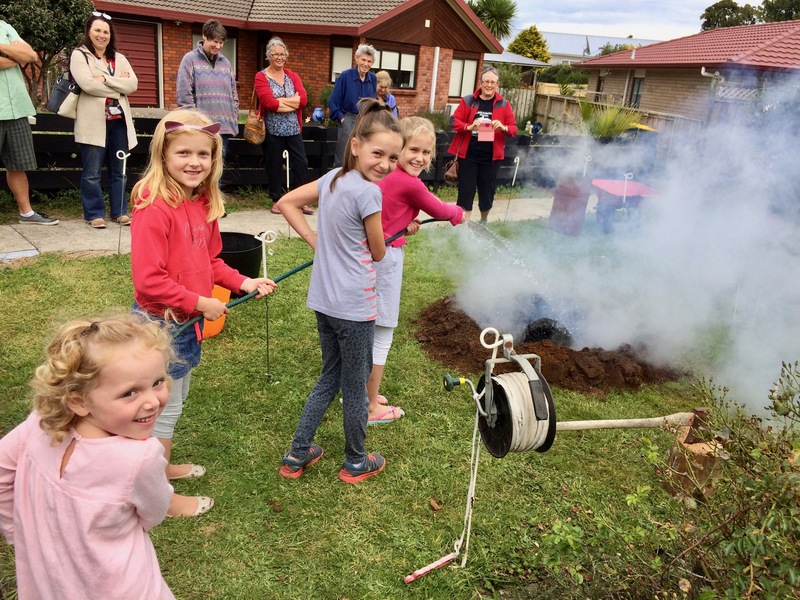 The Pukekohe Anglican Parish are holding their second Charcoal Fire event in the grounds of St Paul’s Anglican Church in Buckland Road, Pukekohe. For each person attending, a 1kg wood block will be burned to make biochar which will be buried in the soil and fruit trees planted on top. This will reduce greenhouse gas emissions by avoiding the CO2 that would have been released back to the atmosphere as the wood decays. It will also sequester1kg of atmospheric carbon dioxide. And even more carbon will be removed from the atmosphere over the fruit trees’ lifetime. Join us between 9 am and 11 am to place 1kg of wood on the fire and learn about biochar. Or join us at 11:30 am for a sausage sizzle before the fire is quenched at 12:30 followed by the planting of fruit trees on the biochar. Park at Buckland School – 72 George Crescent, Buckland. A gold coin donation on entry will help us continue our sustainability work. 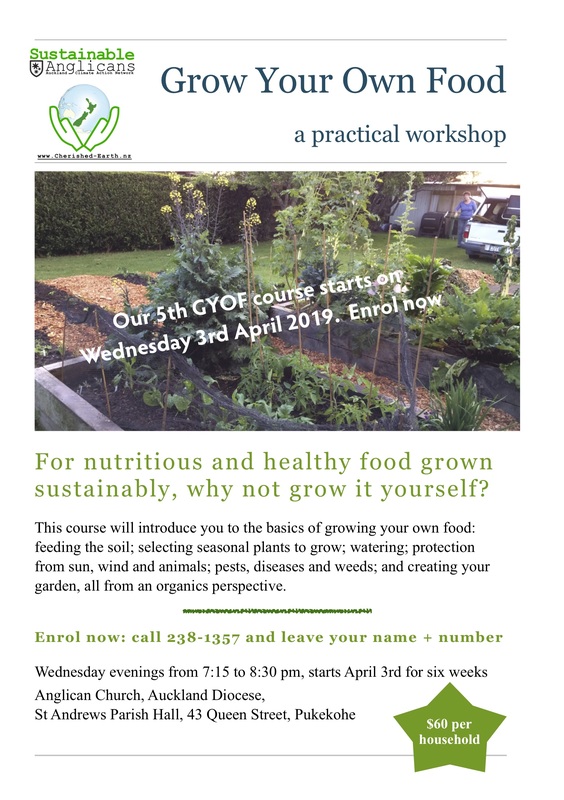 A beginners “Grow Your Own Food” course is offered at Pukekohe’s St Andrews Church hall on Wednesday evenings, starting August 30th. Over six weeks, the workshops will focus on practical, organic food growing techniques that don’t require a green thumb to follow. For many of today’s generation, the arts of growing vegetable have been forgotten or were never practiced. In the uncertain world we are on the threshold of, there are many good reasons to learn those arts. First is that growing your own food is a means for individuals and households to mitigate the drivers of global warming, to adapt to climate change, and address social justice issues. In today’s society, it is easy buy whatever food we want, whenever we want it. The impacts of a warming climate are changing that. For example, the crops that can be grown in some areas is changing due to warmer temperatures, stronger winds and unexpected rainfall patterns. A recent report in the Proceedings of the National Academy of Sciences, a peer-reviewed US journal, concluded that climate change will cut crop yields. A 2015 report by WWF, The Calm before the Storm highlight how disruptions to long supply chains will affect the availability of food. These change will lead to food prices rising. As well as these impacts, there are many others reasons for people to grow their own food. For some, saving money is the reason. For many, it is about knowing what has gone in to their foods. People are looking for ways to avoid the chemical pesticides or genetically modified organisms that are increasingly finding their way in to our foods. For an increasing number, it is about consuming in-season foods, grown locally on family-centred organic farms. This is a reaction to industrialised global food chains that feature excessive food miles, lowered nutrition values and pesticide residues. For others, it is about the simple pleasures of working outdoors, getting our hands dirty in the soil and harvesting what we have grown. For most of us, growing our own food is a combination of these reasons and is a practical action for sustainability and resilience in the face of uncertain world. Take this opportunity to learn the simple arts of food growing.